Water IS Life, Drink Up! The human body is 75% water. 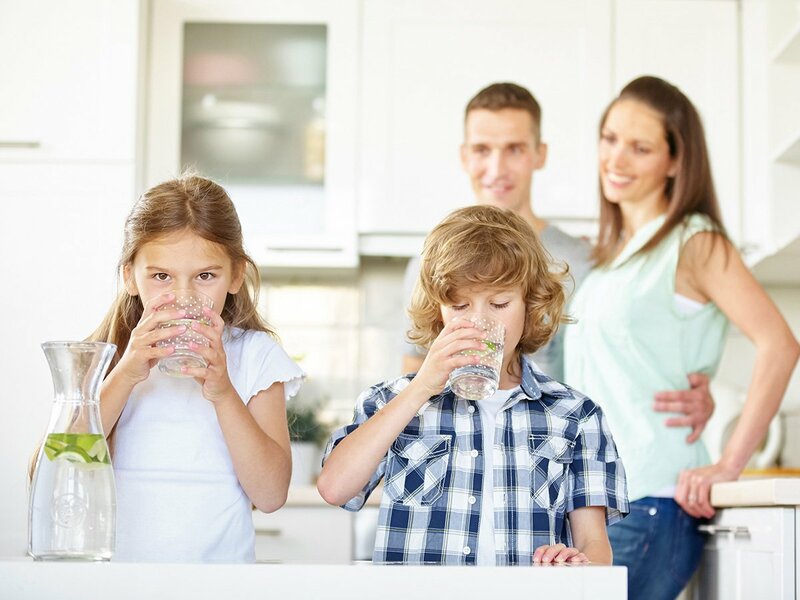 We lose two to three liters every day through normal processes such as digestion, respiration, perspiration, urination and bowel movements—this water must be replenished through diet. 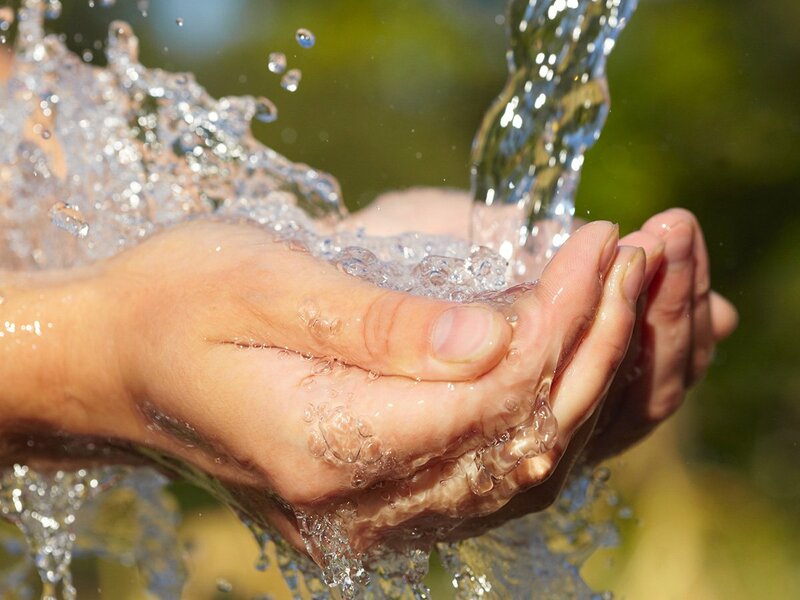 Filtering your water is incredibly important to limit contaminants such as heavy metals, herbicides, pesticides, pharmaceuticals and chlorine, while retaining beneficial minerals. Infusing water with fruit, veggies and/or herbs is a great way to add flavor and nutrients. Want recipe ideas? 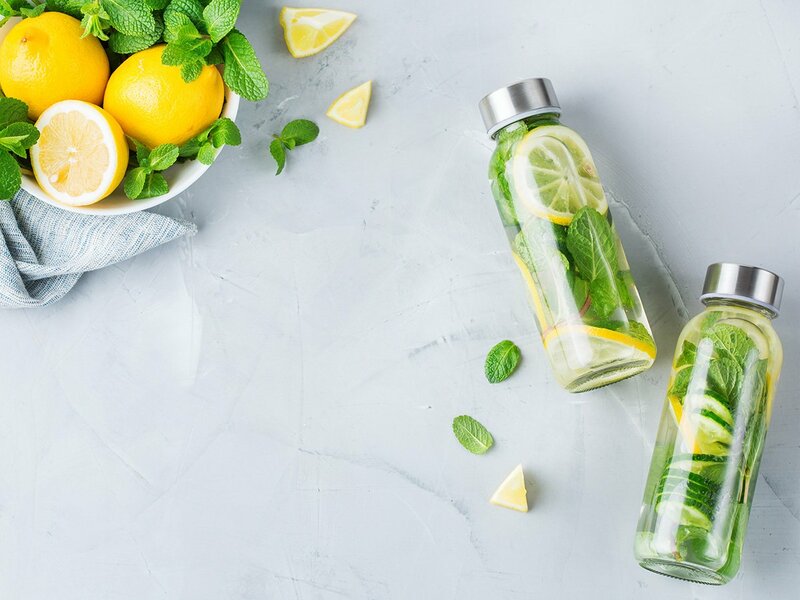 Stop in our Kitchen Market Monday – Friday from 9 am – 6 pm to purchase our Infused Water Kit! With two glass carafes, a bottle brush and infused water guide with 12 recipes, this kit is also a great realtor or housewarming gift! Learn more about the importance of water in our N.E.W S.T.A.R.T Lunch & Learn where we cover the vital, eight steps for a healthy life! On average, the body loses two to three liters of water daily through normal processes such as digestion, perspiration, respiration, urination and bowel movements. Replenishing this water is necessary to lubricate the joints, plump the skin, keep the blood thin and circulating freely, deliver nutrients to the cells, eliminate harmful toxins, fuel the brain, strengthen the muscles and bones, and allow for proper digestion. How do you know if you are dehydrated? The most obvious and straight-forward approach is to assess how you feel – fatigue, irritability, insatiable hunger, frequent headaches, constipation, bloating, and aches and pains are common symptoms that are associated with dehydration. Another easy tool is to look at your urinary tract function – the color and frequency of urination can offer important clues as to hydration status. Healthy excretions are a pale straw color rather than bright or deep yellow. (Note: B vitamins can affect the color of your urine, making it appear a brighter, almost neon yellow). Urinating 6-8 times per day is average; any more can indicate poor absorption whereas less suggests severe dehydration. When is the best time to hydrate? First thing in the morning! Sleep is a very active process that utilizes a lot of water; therefore, you naturally wake dehydrated. Perk up and get the bowels moving first thing in the morning by drinking 16-20 ounces of filtered water before eating or drinking anything else, especially coffee. Even better than drinking straight filtered water is to add a pinch of Himalayan or Celtic sea salt (not table salt) to make your own mineral water. Himalayan and Celtic sea salts are unrefined and contribute up to 87 different minerals including potassium, magnesium, calcium and iron. 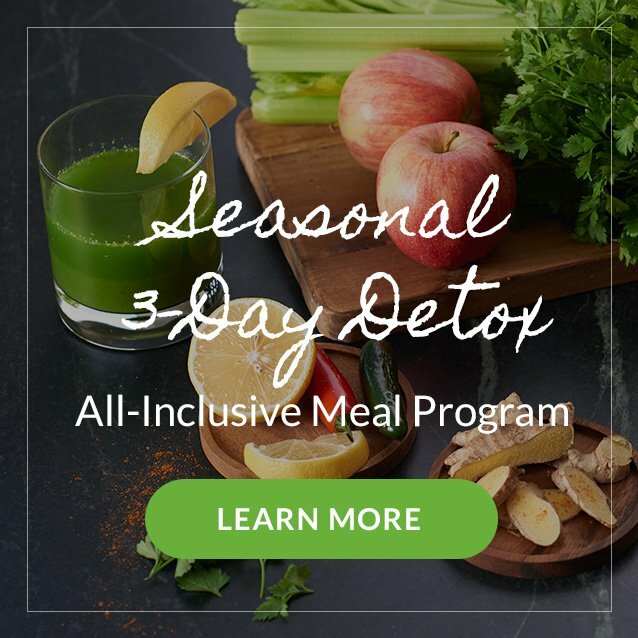 These minerals act as electrolytes that assist in nutrient absorption, toxin elimination, brain function, hormone production and communication around the body. Even slight imbalances in electrolytes can lead to fluid retention, constant cravings, hunger, cramping, fatigue, numbness, nausea, constipation/diarrhea, blood pressure changes and poor wound healing. Make sure to drink water throughout the day—do not just wait until you are thirsty. Once thirsty, you are too late and already dehydrated. Aim to drink half of your body weight in ounces per day, adding two to three additional cups for every cup of coffee, alcoholic beverage or hour of exercise. To avoid flushing away digestive enzymes, we recommend that you do not drink water while eating. Instead, enjoy water between meals—and at least 30-60 minutes before and after eating. We also suggest drinking room temperature or warm water because they are closer to the body’s normal, preferred temperature of 98.6°F. Colder liquids and foods make temperature-sensitive digestive enzymes less effective, rob the body of much needed energy and may even decrease heart rate. For that reason, along with the fact that ice is often contaminated with bacteria, we recommend avoiding ice water with meals, especially at restaurants. Opt for warm lemon water, hot tea or room temperature water instead—and take little sips, if needed, during meals. The source of your water is equally as important as the amount you drink. Filtered water is certainly the gold standard. A good filtration system will remove most contaminants including heavy metals, herbicides, pesticides, pharmaceuticals and chlorine, while retaining beneficial minerals such as potassium, magnesium and calcium. Unfortunately, you are not in the clear buying bottled water. Unbeknownst to many, bottled water is oftentimes even less regulated and infinitely more expensive, than the water that comes out of your tap! Find plain water boring? Then snazz it up! Infusing with fruit, veggies and/or herbs is a great way to add flavor and nutrients. Lemon, cucumber and mint is a Nourished favorite. This energizing blend helps relieve constipation, bloat and brain fog, while boosting the immune system. Another great option for cold winter months is warm herbal tea. Some of our favorites include peppermint for energy, ginger for stomach aches, nausea or indigestion, and chamomile for sleep. Eating your water also contributes (big time) to water intake! Hydrate effortlessly by including more high-water content fruits and veggies such as apples, grapefruit, strawberries, watermelon, cucumbers, celery, lettuce and tomatoes. Water is essential! While you can go three weeks without food, you can only survive three days without water! Most Americans are walking around chronically dehydrated, functioning at a sub-optimal level (to say the least)—constantly dragging, cranky, hungry and achy. Avoid becoming one of these people. See how different life can be by incorporating the simple habit of drinking more water into your daily routine. Cheers! Fad Diets: Love Them or Leave Them? Is Fat Making Me Fat?